I set up a new Ubuntu Linux LXD container, but my auto-completion of bash shell commands are not working. How do I enable autocomplete feature in Ubuntu Linux 18.04 LTS? How do I write simple bash completion code in Ubuntu Linux? Introduction: Bash is an sh-compatible command language interpreter that executes commands read from the standard input or from a file. Bash can run most sh scripts without modification. bash-completion is a collection of shell functions that take advantage of the programmable completion feature of bash on Fedora Linux. 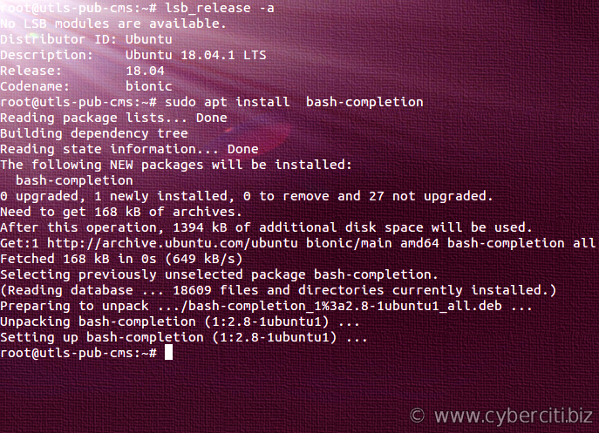 This page shows how to install and enable Bash auto completion in Ubuntu Linux. The easiest way to install bash completion software is to use a package manager such as apt command. You installed the bash-completion package and learned how to create simple function and wrappers. For more info see this page.